Recently I’ve been using our app Let’s Be Social in a new way. I’ve always been able to use the social lessons with my older students just the way they are. However, when working with my younger students who are five and six years old with cognitive/social impairments, the lessons are just too complex for them. So I’ve found a way to use the app and bring it to their level of understanding. To fit my student’s needs, I’ve been creating social stories just for them. The regular lessons would be too complex for some of my kiddos so I write my own. 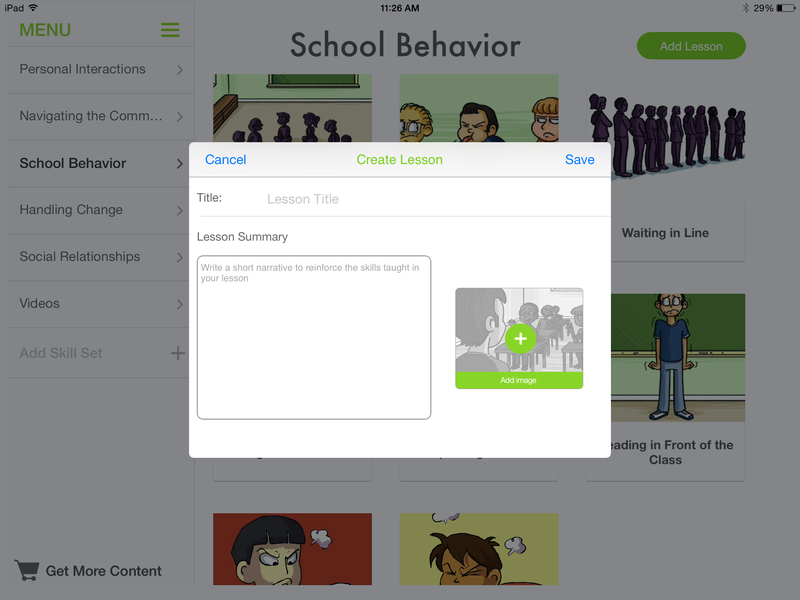 When designing the app in the first place I knew I wanted the lessons to be customizable. As a person who uses apps all the time I found that few apps perfectly fit our students needs as they are. Some may be perfect for one student but not another. Our caseloads are so diverse that we need to be able to make changes to the material we use, so I made sure our app allowed users to create custom lessons. Users can add a lesson to any of our skill sets (categories of lessons) or add their own skill set. We include skill sets of personal interactions, navigating the community, school behavior, handling change, and social relationships. Within each category we have 8 lessons. We also have a separate videos skill set with 5 videos. I’ve been working with kiddos who have some major behavioral challenges. They benefit from using social stories to learn expected behaviors in certain situations. I’ve been using Let’s Be Social to make social stories for each student. I put their name and picture in the story which they love. I also explain what the appropriate behaviors are in a narrative format, like a story. Then for the question and answer portion of the lesson, each question is really just a reminder of what the social story taught. 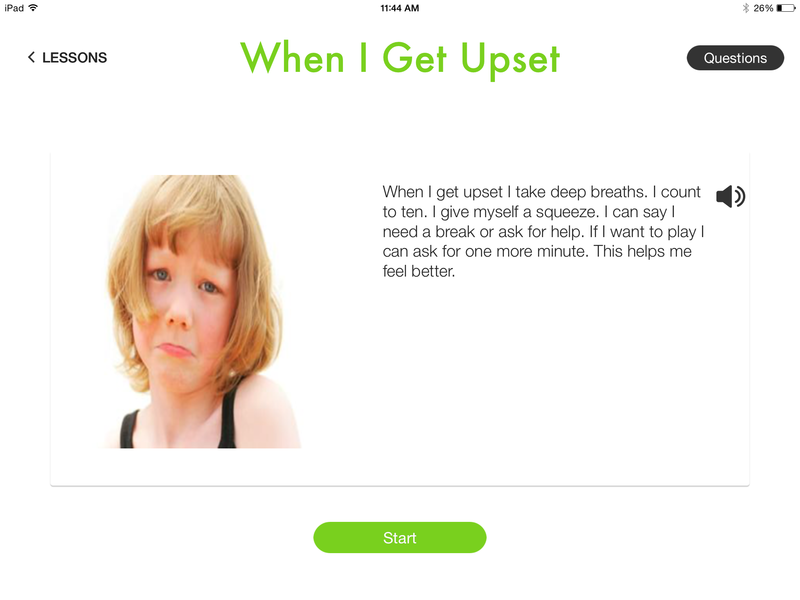 For example, I’m working with a student on using strategies to calm down. The social story tells a narrative of all her strategies. It starts “When I’m upset I can use my strategies. I can take deep breaths. I can count to 10. I can also give myself a squeeze.” So for the questions, I write “What can you do to calm down?” It’s more of a reminder than a comprehension check. The entire team has been using this social story to help our student calm down across settings. The student has a really hard time with transitions so when it’s time to move on to a new activity, the teacher or therapist gets out this lesson and reads it to the student. It been working really well because the student is motivated by the iPad and enjoys seeing her picture in the app, so she stops and focuses on the story. How do you use Let’s Be Social? Let us know on Twitter, Pinterest, or Facebook! Sign up for our mailing list here to stay updated with our latest therapy tips, app announcements, and blog posts.